Home Classic Shell Free How to Windows 8 VIDEO:How to make Windows 8 Look and Feel Like Windows 7? 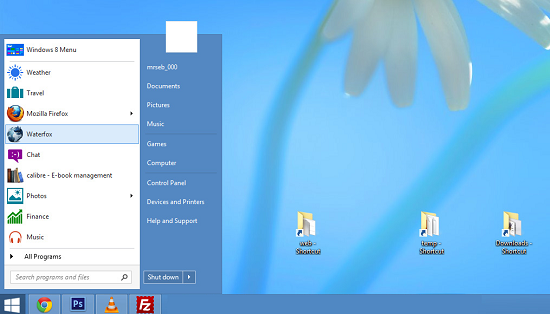 VIDEO:How to make Windows 8 Look and Feel Like Windows 7? Did you happen to hate the Metro Style UI of Windows 8 on your PC? I must admit its nice but only on the touch screen not on the classic desktop. Well in case you are fed up of the Metro UI screen and lack of Start button. There is a great news for you. Just visit the site http://classicshell.net/ and download the application and install it on your computer. It will restore the look of your computer to the classic Windows 7 UI and you can still continue to use the advanced features of Windows 8 in Windows 7 style. Guess what, its a free App and the whole initiative is based on Donations. Do donate if you are willing to, there is no maximum or minimum limit on the amount you can donate so donate as per your wish. Just checkout the below video for a detailed demo.